Earlier this year, I reviewed Marked, a standout utility for previewing HTML- Markdown-, and MultiMarkdown-formatted files. Take a file you’re working on and open it in Marked, and the app shows you exactly what that document will look like when rendered as HTML in a Web browser—and that preview is updated in real time as you edit the document. I tested Marked for a few months before writing that review, and it ended up becoming a utility that I use every day and an essential part of my workflow. Like many people who write for the Web, I use publishing tools—Macworld’s content-management system, Calepin, and a couple others—that don’t make it easy to see what your code will look like when published. Either they offer no live previews, or (in the case of the Macworld CMS), they require you to make changes, save those changes, and then reload a preview. With Marked, the process is much simpler: Whenever I’m editing an article or document destined for Web publication, I just open that file in Marked. I’ve now got a preview of my document that’s instantly updated whenever I save changes in my editor. (I do most of my writing in BBEdit, and I’ve even got a BBEdit script that opens the current document in Marked.) The fact that Marked previews both Markdown and HTML code means that it works with both of the Web-authoring languages I use, when writing and editing, every day. Of course, BBEdit already has a live-preview feature, as do several other text editors, but Marked’s previews are simply better. For example, the program offers a number of preview styles, and you can add your own CSS templates—I have one that mimics the style sheet used by Macworld.com, so I get a pretty good idea of how my articles will look when published on this site. And if a document has sections with headers, you can quickly jump to any section in the preview. Marked’s previews also include document statistics, readability metrics, and a nifty visual-highlighting feature that helps you avoid word repetition. In other words, Marked’s previews help writers write better. On Monday, Marked’s developer released a major update, version 1.4. I’ve been testing Marked 1.4 for a while, and it improves the program considerably—although it also limits the program to Lion (OS X 10.7). The most obvious new additions are two new preview styles, Amblin and Upstanding Citizen, each of which is quite good—I’m particularly fond of Amblin. But there are a slew of other new features that improve the app’s utility. My favorite is a tiny one: Whenever you save a change to your document, Marked can automatically scroll its preview to, and mark, the location of that change, making it easy to immediately see how a particular change affects the output. The feature isn’t perfect—as the developer notes, it’s a difficult thing to get right—but it works well enough that I’ve come to depend on it. Another favorite is that when using the HTML-source feature—which displays the HTML code that corresponds to a Markdown document’s text and formatting—Marked now uses syntax highlighting on HTML/XML entities. Similarly, if your document has code blocks, Marked will now use syntax highlighting when previewing those blocks. The developer has also added support for a special syntax for forcing page breaks when printing. Scrivener users will appreciate that Marked can now display full-project previews and has added support for inline footnotes. 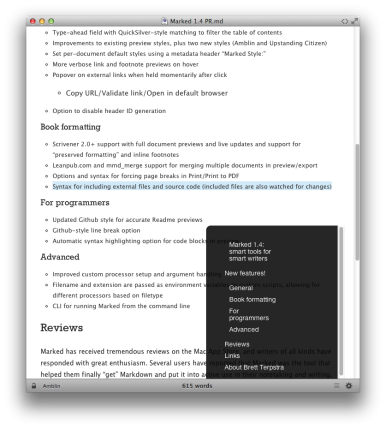 Marked can even create hierarchical headers based on your project’s pages, and it will automatically convert text marked in Scrivener with “Preserve Formatting” to code blocks in the Marked preview. For those who don’t use Scrivener, Marked now supports several mechanisms (including Leanpub and a special syntax) for including multiple files in a single preview. Advanced users get some new features, too. If you use different preview styles for different documents, you can now add a simple metadata style header to your documents; Marked will use that header to determine which style to use when previewing each document. You can also now run Marked from the shell (command line), you can use fenced code blocks, and if you use custom file processors, Marked can now automatically choose a processor based on each document’s filename and extension. 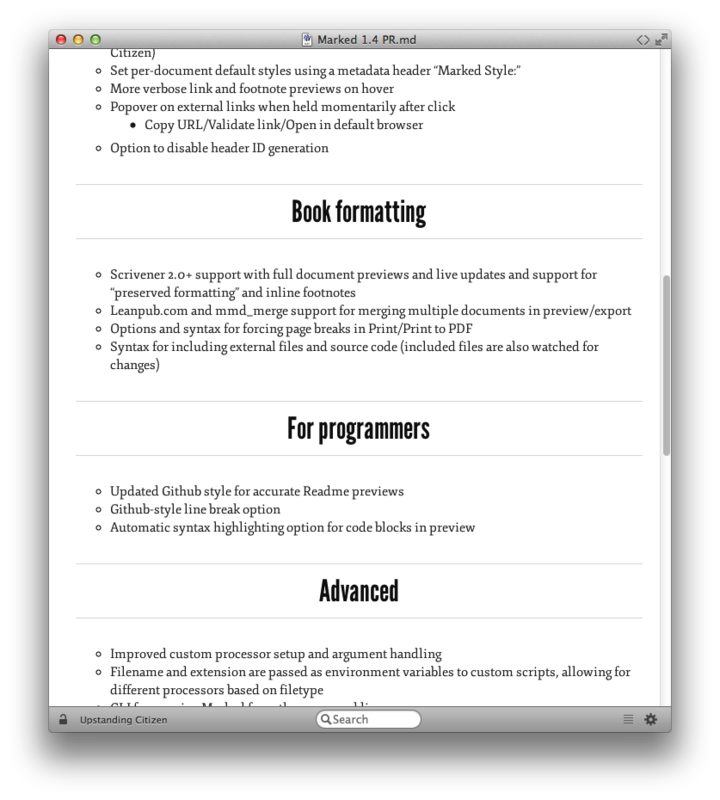 Finally, the latest version of Marked includes a few minor tweaks that enhance the app, such as full keyboard navigation of the preview’s table of contents. Marked obviously isn’t for everyone—if you don’t write for the Web, for example, Marked’s utility will likely be lost on you. 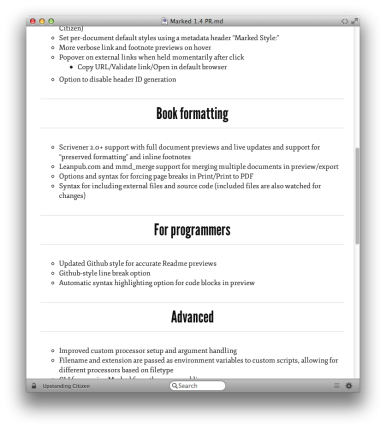 But as someone who’s always writing or editing multiple Markdown and HTML documents, it’s become an essential tool, and the new version is a nice update.